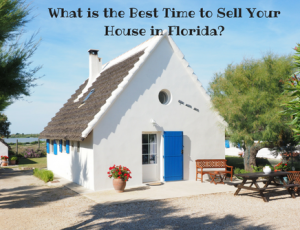 So when is the best time to sell your house in Florida? All in all, according to the research above, the best time to sell your house in Florida depends on your own situation. However, trends have shown that more buyers are looking to buy in the late winter and early spring months. Therefore, these times are a good for selling your Florida home. Just keep in mind that the type of property you are selling plays a major role into your timeframe as to when you should sell, as well. With the housing market looking up in 2017, this is the year to sell your Florida home! Consider When People Are Looking To Buy. An article by Sarah Max says that home sales tend to rise with the temperature. Therefore, the warmer it is, the more potential there is to be potential buyers searching for a home. Families looking to move will wait to move when there kids are on summer vacation. This means they want to find something in the earlier months so they can take the summer to get settled in. Acknowledging this, sellers often decide to not list their homes late in the year, and many pull their listings in late fall in hopes of starting fresh in the spring. An article by Tom Day says that sales activity can fluctuate depending on the seasons in Florida, but not as much as people think. It depends on the type of property you want to sell. For example, if you you are selling a family home there is typically more people searching to buy before the school year in the fall. This typically happens because they want to get into their new house before the children start school. However, if you are selling your vacation home then the best time to sell is during winter and spring months. These homebuyers will want to make sure it is ready for their next vacation. If your property is merely for investment there is typically little influence of the seasons. This is because the main goal is to get a return on the investment.